Matt Miller (Swamp Guinee), is a multi-genre, world traveled musician, performer, recording artist, songwriter, actor, instructor and youth mentor from Washington, D.C. For over three decades Matt has played professionally as a percussionist in Go-Go bands (an indigenous underground genre within Washington, D.C). He later became inspired to learn world music from the African diaspora and developed his versatility as a percussionist within a variety of musical styles. Matt has had the honor of studying under the likes of late master drummer Baba Ngoma, and G.H. Abasi Johnson. 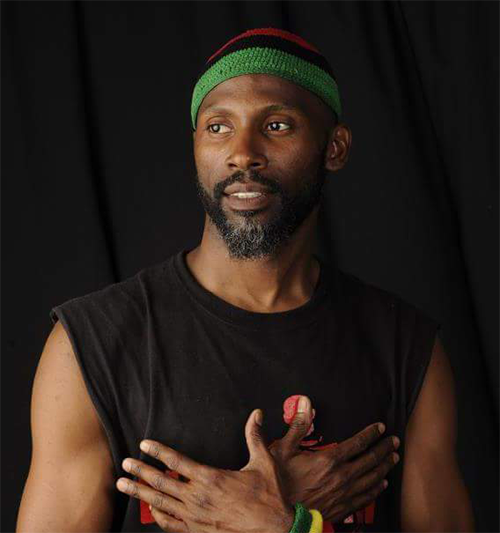 As a cultural arts advocate, much of Matt’s work has been dedicated to healing and educating through the arts. He has toured, recorded, produced and performed with Junior Marvin (Bob Marley & the Wailers), Bambu Station, Bebe Winans, Sheryl Lee Ralph, Dorinda Clark-Cole, Malik Yoba, Thievery Corporation, The Addison Bros. Jazz Quintet, Roots A Risin, Frankie Addison, I Grade Records, Juju House, Baba Ngoma, Donovan Philips Leitch, Tony Addison, Pure Light Seed, Ellsworth Gibson (RIP), Nina Angela Mercer, Ocean Ana Rising Inc., The Sanctuary Theatre Co, The Washington Performing Arts Society (WPAS), The Alvin Ailey Extension Program, The Alvin Ailey School, and many more. Matt is also the Co-founder of Jaguar Youth International, an aspiring non-profit youth arts and cultural enrichment program based in Washington, D.C. He has also served as director of the music program, “Life Stories” with The Theatre Lab, a National Endowment of Arts and Humanities funded program for incarcerated youth at the New Beginnings Youth Rehabilitation facility in Washington, D.C. Matt has and continues to serve his community within drumming and arts enrichment initiatives such as Martha's Table, Caesar Chavez Public Charter School, New Beginings Youth Development Center, and Beta Academy. In 2014 Matt was featured in WETA's critically acclaimed documentary, "Washington, DC in the 80's," which received the 2014 National Academy of Television Arts and Sciences award, and was recognized as the Best Outstanding Historical Documentary by the Nat'l Capital Chesapeake Bay Chapter. In 2017 he was also selected to serve as a panelist within "What is Native D.C." at the 2017 Smithsonian Folklife Festival.